Commonplace learning events are high-quality, resource-effective workshops and seminars designed to fit the needs of small nonprofits and business. Connect with a small group of organizations around a shared challenge or opportunity to learn practical tools and education. Need help on a topic you don't see below? Contact us. Register below for 2017 "beta" events or stay tuned for more fun in 2018. About: Are you a nonprofit who wants to partner with other nonprofits or individuals by accepting donations on their behalf? Or do you want to ask a nonprofit to accept donations to sponsor your community-good projects? Lawyers (and the IRS) call that a "fiscal sponsorship." 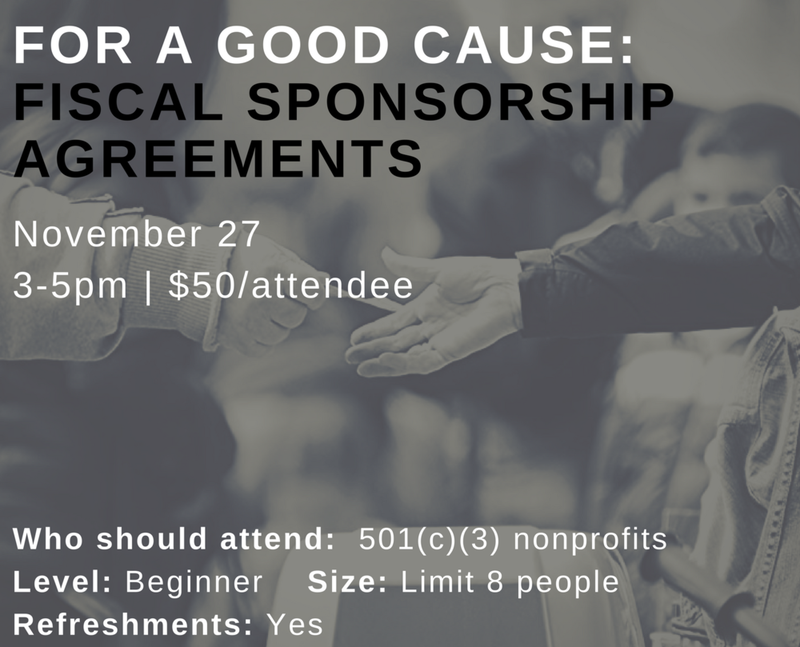 This seminar will cover the legal basics of fiscal sponsorships; when it is good idea (given your values, brand alignment, and program impact and engagement goals); and best practices for partnership. Attendees may also sign up for one-on-one review of a template fiscal sponsorship agreement for their organization and for personalized advice regarding partnership approaches. Limit 8 attendees. Presenters: Megan Olds founded Parallel Solutions, which offers consulting services related to community development and engagement, strategic business planning, fundraising, and partnership coordination. Kate Redman, with Commonplace Law, is an attorney specializing in 501(c)(3) nonprofit legal issues. THIS IS A TWO-DAY EVENT: DECEMBER 6 & 13, FROM 1:00 - 4:00 PM. About: If you are a small 501(c)(3) nonprofit that has been meaning to develop or update an employee handbook, this workshop series is for you! Over two sessions, we will walk through an example employee handbook for small organizations (fewer than 10 employees), including review of the applicable legal rules and best practices for compliance. Participating organizations will receive a template handbook with suggested language to tailor the handbook to their organization’s needs. Each session will include 1 hour of workshop time for participants to work on their handbooks. Organizations interested in personalized legal advice can schedule additional one-on-one time at a heavily discounted rate. Kate Redman, with Commonplace Law, is an attorney specializing in 501(c)(3) nonprofit legal issues. Presenter: Brian Beckwith co-founded Current Consulting ("cool people masquerading as consultants") and is triple-threat JD/ CPA/seriously-bearded person. He has public accounting experience, specializing in non-profit audits and taxes, and sits on numerous non-profit boards.